Couldn’t resist a real Christmas Tree? 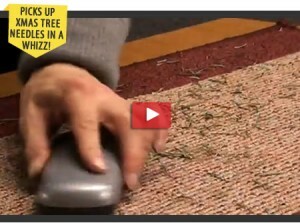 There are lots of good reasons to have a real tree and lots of good reasons to get a Whizzkleen Brush! It isn’t only really efficient as a crumb sweeper, but this little gadget will sweep up all those spiky little Christmas Tree Needles so removing the need to get the hoover out every hour! The shedding of pine needles creates the time consuming task of picking them up and these spiky little needles stick into your dog and cat’s paws, they are carried throughout the house on socks or slippers and even more are deposited when getting the tree out of the house! This little Whizzkleen Brush will become your best friend during times such as these, because this best selling product picks up Christmas Tree needles from carpet in a whizz! Not only that, this clever little brush has many other uses in the home! In the kitchen – however fastidious you are about cleaning your kitchen there is no way to avoid crumbs building up on the worktop and other surfaces. The most effective way to remove them is to use the Whizzkleen Table Brush – in fact it is often used in restaurants to quickly clean up the table debris after each customer. It’s great for cleaning the snow off your shoes and floors, cleaning dirt particles from hard to reach areas of your car and caravan (ideal for travel being so small too), and it is even used to remove loose crumbs when you want a professional finish when icing a cake! No plugs, no leads and no batteries are needed! Ideal for any job large or small! Hand held, easy and fast to use! They do say the best things come in small packages and the Whizzkleen Crumb Brush proves it.